The following is a detailed account of the snap Russian exercise that took place between the 16th and 21st of March 2015. The exercise began as an operation in the far North centred on the Northern Fleet but was quickly expanded to encompass the entirety of the Russian Federation. The exercise would eventually involve 80,000 personnel, 12,000 pieces of heavy equipment, 65 warships, 15 submarines, and 220 aircraft. 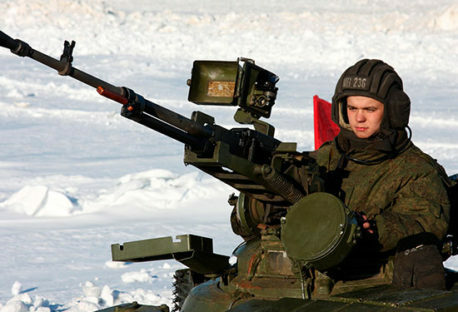 The broad theme of the exercise is that of the territorial defence (based on rapid reinforcement) of Russia’s outlying regions, with a particular focus on the Kola Peninsula and the outlying Arctic isles, the Kaliningrad exclave, occupied Crimea and the Black sea, and the island of Sakhalin in the far East. 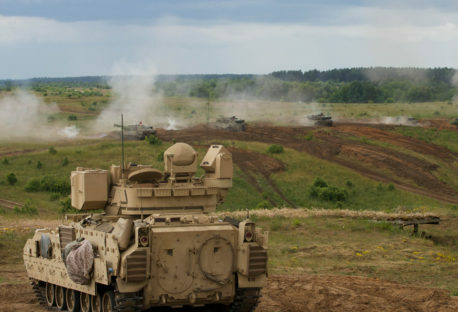 This was supported by large scale combined-arms exercises in central Russia. The scale of this exercise means it could only have been a scenario simulating a war with the United States and/or NATO. The interactive map below provides a detailed examination of this exercise on a step-by-step basis, showcasing the process by which certain units were activated, moved into position (often over several thousand kilometres), and then engaged in simulated combat. These redeployments are supported by a wide range of naval and air activities designed to contest and control the sea lanes and airspace surrounding the Russian Federation on a scale as yet unmatched by NATO. The map proceeds in a chronological manner, with the dashed line representing this chronological process rather than troop movements per se, whilst each slide includes a link to original source material. A corresponding map detailing the NATO exercise Allied Shield (5-28 June 2015) is available here. Preparing for the Worst: Are Russian and NATO Military Exercises Making War in Europe more Likely?